I have been in IT industry for fifteen years and for last three and half years I been in consulting firm. I really like the type of work I usually do as a consultant. Issues that we have to deal with are usually different and more challenging. Systems we have to build requires more focus and special architecture and extra care. In this industry I do meet new people and a really like to pair with others, teach and of-course learn new things. Last week, I started working for a new company called Readify. Programmers in Australia, specially Microsoft stack programmers, would probably know Readify. But for those who don’t know, Readify is the best Microsoft Consulting company in Australia which has offices across major states in Australia (NSW, VIC, QLD, Perth and SA). I’ve been interested to work for Reaidfy since I came to Australia. But it happened for me after four and half years. Many thanks to my good friend Hadi Eskandari who mentored me during last year when I was studying so hard to get through. Anyway, If you want a challenging workplace, pairing with smart and knowledgeable developers and using bleeding edge technologies, probably Readify is one of places you might want to consider to work in Australia. During past few years great developers have been working for Readify. To name a couple of them, Damien Edwards who is currently program manager at Microsoft at ASP.net team and Paul Stovell creator of famous deployment tool called Octopus Deploy. And many others who still work for Readify. Its an opportunity to work in challenging environment with high quality expectation. When a client choose Readify, most likely there is a challenging issue or project. I as a consultant have the opportunity to work with highly skilled and smart people in different project. Now, let me tell you about first impressions I’ve got since I’ve started with them. I signed the contract nearly six weeks ago and immediately a couple of days after, I got access to my corporate email and other documents so I got myself familiarized with the processes and introduced myself to the team before actually starting new job. Everything was surprisingly well organised and open. I got my allowance to buy gears and get ready for my new position at Readify. The allowance is enough to buy a decent ultrabook or mac book pro which gets renewed every two years. I decided to buy a Surface pro 3 which I will blog about that later. Anyway, I had a chance to get everything ready before the very first day. Day one when I went to Readify’s nice office in the city everybody were welcoming to me and helping me to get started. There is is buddy system at Readify which helps new Readifarian get through all induction stuff faster. My buddy Jorge helped me to get through all the stuff quickly. I had a chance to have a chat with one of the principal consultants (Richard Banks). Although principal consultants are busy but they are available to help developers and other consultants. Basically we can reach them quite easily. During past week I had a change to meet other principal consultants and senior consultant and catch up with them. At Readify everybody gets number of days annually to work on professional development, we can self study new technologies, prepare for exam, write an article or get ready for presentation. First few days I had a chance to look at new interesting changes in mobile area with Xamarin products. Xamarin has gained a lot of attention recently especially in enterprise. I will write more about them later. So far it has been great experience working at Readify and I have just started my first gig this week which is going to be awesome. Stay tuned I’ll blog more to share technical and non-technical stuff. In this example, only x, y, sum and return value are in thread’s stack and number variable will be held in heap as part of object instance and is accessible using this keyword (which compiler let you omit that). In other word when we say object instance is created in the heap, what does really stored there? Field members are object state that needs to be stored in object instance. Imagine you have multiple instances of SQL server on your server and one of them is using almost all of available memory and second one is facing memory shortage. What are possible Cause for this symptom. Does one of application have memory leak? The answer is NO, When you install multiple instances of SQL server on a single server you have to consider memory allocation for each instances because windows does not balance memory across applications with the memory notification. The first instance with a work load will used huge portion of memory (Especially when you have actual data – not testing – on that instance). Three approaches are available for Server Memory Option documented in the section “Sunning Multiple Instances of SQL server” and if you have selected third one which is “Do nothing”, you might have same problem. Do nothing (not recommended). The first instances presented with a workload will tend to allocate all of memory. Idle instances or instances started later may end up running with only a minimal amount of memory available. SQL Server makes no attempt to balance memory usage across instances. All instances will, however, respond to Windows Memory Notification signals to adjust the size of their buffer pools. As of Windows Server 2003 SP1, Windows does not balance memory across applications with the Memory Notification API. It merely provides global feedback as to the availability of memory on the system. I am writing a series of posts about WPF Browser Application, XBAP and configuration tips. 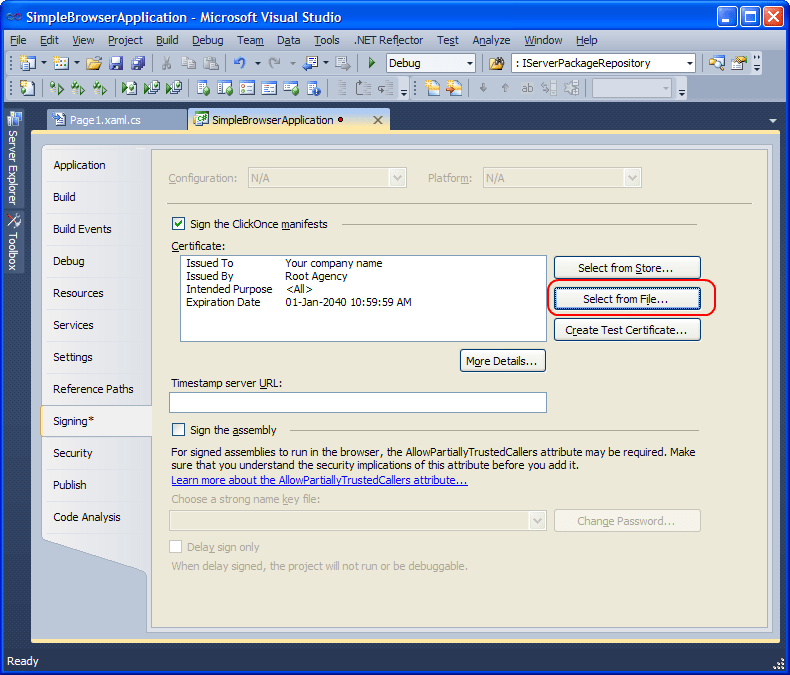 I’m going to host this application in IIS 5.1 and I developed them in .Net 3.5. 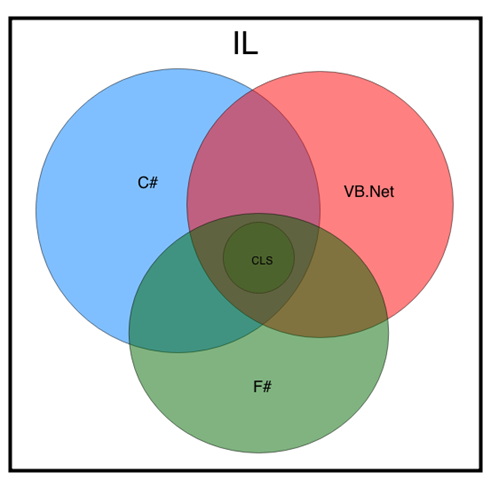 The reason I have chosen IIS5.1 and .Net 3.5 is because of challenges I had in one of my recent projects. Configuring this type of projects is different in other versions of IIS and .Net frameworks and they are not is subject of this post series. 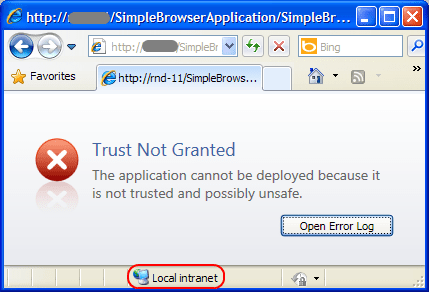 Note: Making a browser enabled application as full trust according to this method is not completely secured. This can be used for testing purposes in testing environments. 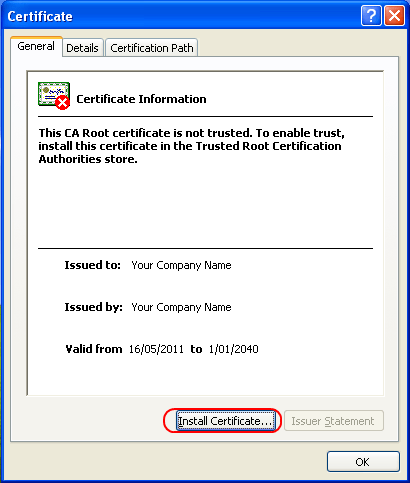 Please select proper certificates and known trusted root certification authorities. Before starting I think its better to have same understanding of file extension that we are going to talk about. We have created a simple WPF Browser application and a simple windows application which is hosted inside the XBAP application. When we created WPF application Visual Studio automatically create a .pfx (Which is used for signing ClickOnce manifest). A password dialog box will be displayed and you set your own password. This command creates two files one private key and one certificate. Step2: Then you need to create PFX file which is used for signing ClickOnce manifest and contains both private and public key. Step 3: Back to the solution explorer delete “SimpleBrowserApplication_TemporaryKey.pfx” and goto Application property page and select signing tab. Click on “Select from file” and select the PFX file you have just created. Step 4: Just like before publish it to you server. Step 5: Give certificate to the client and register the certificate on the client machine. To do this double-clicking on .cer file. You will see following window. Click on Install Certificate button. Follow installation wizard and click Next on the first window. 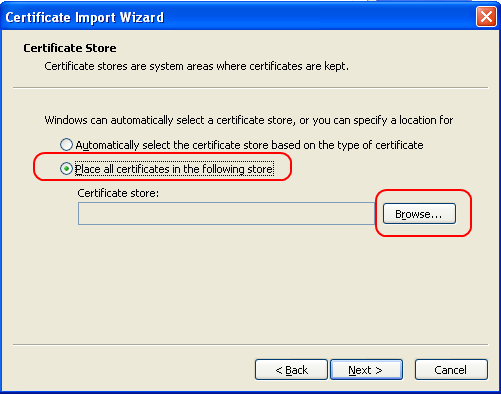 In this window select “Place all certificates in the following store” and then select “Browse…” button. 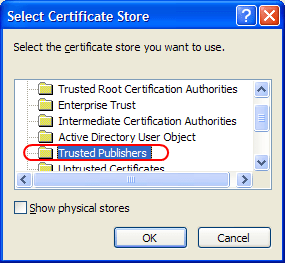 In this window select “Trusted Publishers” and then click Ok. Select “Next” previous windows and then select finish. 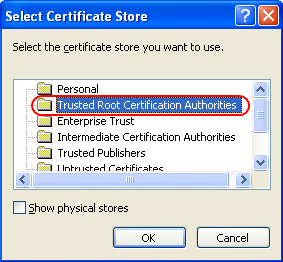 Step 6: Redo the step 5 but this time select “Trusted Root Certification Authorities” as the certificate store. Now you have enabled your client to accept this XBAP application as full-trust application. Imagine we have an existing windows form application or you are developing a windows form application. The question is how you can make your windows application browser enabled. The answer is Browser Enabled WPF application. But usually when we create a WPF application we have to use WPF elements inside Xaml. 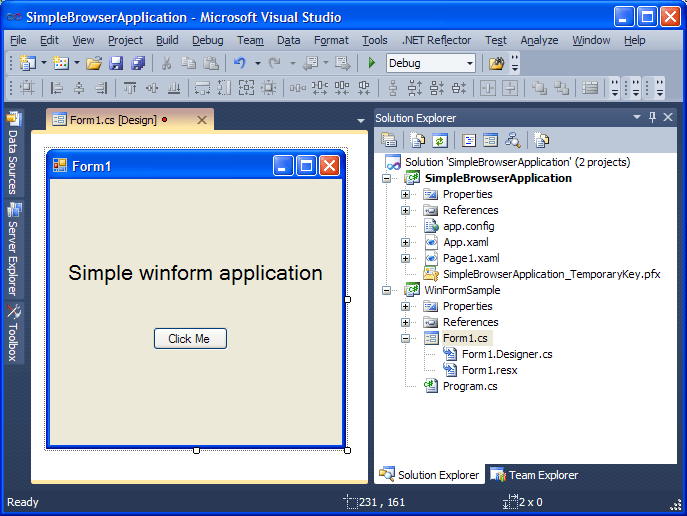 “WindowsFormsIntegration” will help you to host your windows form application inside your WPF. For rest of this post I consider you already have previous post sample, because I’m going to update the same project. Lets open the SimpleBrowserApplication and add a reference to “WindowsFormsIntegration”. 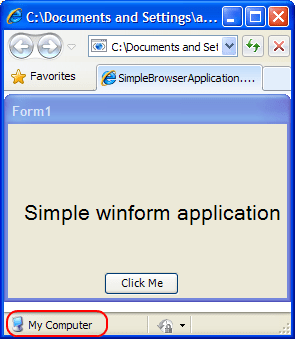 As the second step I want to add new project to our solution of type “Windows Form Application” and I call it “WinFormSample”. Note: Make sure when you are creating windows form application you selected .Net 3.5 because we are going to reference this project inside WPF project and they should be compatible. Actually this is a place holder for WindowsFormsHost that we are going to place in main form. For next step we need add System.Windows.Froms reference to WBP project. Then we have to change page1.xaml code as follow. We created a WindowsFormHost and added this control into stackPanel Child list and set the child property of windowsFormsMost to mainForm which is already instantiated of Form1. One of important thing is setting mainForm.TopLevel to false. Because if you don’t do that you will get an exception and if you dive into innerexeptions you will find out that main reason is System.ArgumentException: The child control cannot be a top-level form. If you run this application you’ll see following browser window which hosts Form1. The point is when you run this application from visual studio it runs in My Computer Zone so there is no problem for security. According Microsoft document “WPF Partial Trust Security” section “Partial Trust Programming” when you run WPF application which requires full trust and current zone is “My Computer” behavior is “Automatic full trust” and for getting full trust no action is required. But if you publish this project and try to browse this application you will get Trust Not Granted error. Because application will request for full trust and it fails with “Trust Not Granted”. In order to get full trust is signing XBAP with certificate. In the next post we will see how to sign XBAP with your own certificate and make it work.